In many ways, arts and culture are the heartbeat of a city. Eugene has a vibrant and varied arts community, featuring top-notch music, dance, theatre,visual art and more. Our creative spirit draws people here, and it inspires us to stay. In this year’s issue of the Arts and Business Alliance of Eugene Arts Guide, we’ve highlighted Eugene’s arts and culture community and touched on the many ways you can get involved. 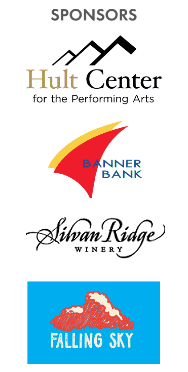 Representatives of these organizations will attend the upcoming Arts After Hours on April 11, 2019, at the Hult Center for the Performing Arts. Arts After Hours is a unique opportunity for business leaders to learn about and connect with the amazing variety of Eugene-area arts organizations and artists. More than just an enjoyable social event, Arts After Hours is also an opportunity for Eugene business and arts leaders to create new relationships, strike up conversations about future partnerships and discuss the congruent interests of the arts and business. ​Explore the following pages and discover all the opportunities to tap into your creative side! ​#instaballet is a unique interactive dance company specializing in accessible performances and audience participation. Through an original model, created by co-founders Antonio Anacan and Suzanne Haag, performances are shaped as the attending audience is asked to create a new ballet in real-time with professional dancers. Performances focus on joy within the creative process and a demystification of ballet and serves as a fun activity for audience members of all ages and abilities. Seeking volunteers and sponsors for the upcoming season and looking to expand its already-stellar board. Free summer performances, starting in May 2019. The 20x21EUG Mural Project is an initiative of the City of Eugene Cultural Services Public Art Program to create 20 or more world-class outdoor murals in Eugene before the 2021 IAAF Worlds Championships. 20x21EUG aims to bring color and life to Eugene’s urban landscape with a week-long mural festival, Eugene Walls from July 27 – Aug. 2, 2019. Take a tour of the completed murals—18 so far—by downloading a mural map at 20x21EUG.com. Businesses can partner through sponsorships, in-kind donations of goods, services and hospitality, or volunteer at a mural site during Eugene Walls. The mission of Actors Cabaret of Eugene is to offer experiential education for performers and technicians and provide a quality theatrical experience for the community. Actors and stage crew are volunteers and the focus is almost exclusively musical theatre, as part of a dinner/brunch. A former South Eugene High School drama teacher, Joe Zingo serves as artistic director. ArtCity cultivates an art ecosystem that empowers artists to grow their practice, invites community members to engage creatively, and helps our city thrive culturally and economically. Would you like to participate as an artist, sponsor or collaborator? There are many ways to participate and make art happen! ArtCity is seeking board members and committee members, as well as professional development mentors. Go online to learn about Rain Play, The Umbrella Project and the Umbrella Project Auction. Ballet Fantastique (BFan) is a powerhouse for inventive dance theater in the Northwest. Established in 2000, BFan re-imagines the future of dance—building inclusive new audiences through contemporary ballet premieres (Company), training a diverse next generation of artists (Academy), and inspiring youth through education programs that reach across traditional access barriers to reach underserved kids (Outreach). BFan is always seeking board members and volunteers! Check out our upcoming world-premiere of Cleopatra, happening Mother’s Day weekend at the Hult Center. Recognized by the State of Oregon as an Oregon Heritage Tradition, the Bohemia Mining Days Festival packs the third weekend in July with entertainment and cultural experiences, celebrating Cottage Grove’s colorful history. All ages will enjoy live entertainment, parades, Kids Zone, Helena (under-21 only) Saloon, contests and a historical treasure hunt with cash prizes, demonstrators, 80+ vendors, train, carnival, zipline, beer and wine garden, themed meals and more. Volunteers, Donors & Vendors needed now to help celebrate the 60th “Diamond Jubilee,” July 18-20, 2019, at Coiner & Bohemia Parks. Free admission and parking. As the first resident company of the Richard E. Wildish Community Theater in Springfield, Chamber Music Amici’s mission is to produce excellent, affordable chamber music concerts that appeal to all ages. With the motto “Creating community through great music” Amici promotes the development of a new generation of music lovers in collaboration with public schools in Springfield, Eugene and Cottage Grove, along with other arts organizations, businesses and local governments. From committee-level to strategic planning at the board level, there are many ways to get involved! EUGfun, a program of City of Eugene Cultural Services, offers more than 100 free, family-friendly events throughout summer and fall. The EUGfun series provides opportunities for community members to connect, create and be entertained throughout our beautiful city. Events include live music, movies, dancing, human-powered fun, library events, theater in the parks and more. Join in at events and help spread the word! Visit eugfun.org or pick up your free EUGfun guide at Eugene community centers, pools and libraries. A collaboration of a local design team and nonprofit St. Vincent de Paul Society of Lane Co., Envia Fashion of Eugene brings you stylish, upcycled and repurposed products that you can feel good about, by using a sustainable business model that diverts waste, provides jobs and supports our community in multiple ways. Join Envia Fashion for St. Vinnie’s Metamorphose Earth Day Celebration on Saturday, April 20, 2019, at Lane Events Center, featuring inventive style that makes a difference, including upcycled art, fashion and fun! Eugene Ballet provides high-quality, professional dance performances and innovative educational services to a broad-based audience in Oregon and throughout the western United States. Eugene Ballet has set a high standard in the performing arts, differentiating itself among dance companies in the West and nationwide with its ability to present outstanding work and educational services in both rural and urban communities. Eugene Ballet is seeking to expand its volunteer base, as well as its Board of Directors. If you are interested in getting involved, please contact Eugene Ballet. Since 1975, the Eugene Concert Choir, led by Artistic Director and Conductor Diane Retallack, has performed its way to becoming a celebrated pillar of the rich cultural fabric of the Pacific Northwest—an enduring, vital part of the community that gives adult avocational singers the opportunity to perform at a professional level, so that the beauty and power of choral singing are enjoyed and appreciated by all. Eugene Concert Choir has sponsorship and advertisement opportunities for its 2019-20 season and, as always, welcomes new partnerships with local businesses. Eugene Opera’s mission is to bring the highest quality opera possible to Eugene and surrounding areas and to contribute to the future of the art form by increasing the audience and financial resources for opera, by identifying and engaging emerging artists of professional potential and by developing educational programs for schools, young artists and the community at large. Upcoming performances include “As One” on May 17 & 19, 2019, at the Hult Center. Eugene Opera is also actively recruiting board members. Eugene-Springfield Youth Orchestras (ESYO) has kept youth music alive in our community since 1934. Its mission is to inspire and lead students on a journey of discovery through orchestral instruction and performance. Each year, it awards more than $30,000 in scholarships for classes, orchestras and instrument rentals, so that any student can participate. From beginning to advanced ensembles, ESYO gives young musicians a place to learn, grow, lead and play! Attend the Eugene-Springfield Youth Symphony concerts, as part of ESYO’s 85th Season, May 21-23, 2019, 7:30 pm, at South Eugene High School. The musicians will astound you! The Eugene Symphony pursues its mission of enriching lives through the power of music by presenting classical, pops and community engagement performances and by regularly commissioning and premiering new American works. As a guiding principle, the Eugene Symphony is committed to serving, educating and developing the widest possible regional audience through its programs. More than 26,000 people now attend Eugene Symphony’s classical, family and special performances each year. Eugene Symphony partners with the creative geniuses at Harmonic Laboratory to present “The Color of Sound” on April 18, 2019, 7:30 pm, at the Hult Center. Since its grand opening in 1982, the Hult Center has been charming audiences and popular performers with its stunning architectural and acoustical features. Operated by the City of Eugene Cultural Services Division, The Hult Center is part of the City’s Library, Recreation and Cultural Services Department and features the Hult Presents series, along with six amazing local resident companies. Get involved by interning, or join SHO (Support HultCenter Operations), or just stay in the loop via the Hult Happenings weekly email. Inspirational Sounds is a nonprofit, music and performing arts organization. Its mission is to promote the heritage of African-American gospel musical traditions, which are rooted in American music. It provides professional art productions and educational awareness to engage diverse communities in the arts by teaching gospel singing and by bringing about unity among various racial, ethnic and cross-generational constituents of our community. Singers and production assistants are welcomed year-round. Attend the “Honey Whiskey Trio” show at The Shedd Institute, Friday, April 5, 2019, 7:30 pm; dinner at 6 pm. The only academic art museum in Oregon accredited by the American Alliance of Museums, the University of Oregon Jordan Schnitzer Museum of Art (JSMA) features engaging exhibitions, significant collections of historic and contemporary art and exciting educational programs that support the university’s academic mission and the diverse interests of its off-campus communities. Businesses can collaborate through sponsorships, corporate giving and by joining the Patron Circle Corporate Program for exclusive partnership opportunities. Karin Clarke Gallery was founded in 2002 by the daughter of accomplished Eugene artists Margaret Coe and Mark Clarke (1935-2016). The gallery’s mission is to mount museum-quality shows of established Oregon artists, with an emphasis on painters. This small and elegant downtown gallery features monthly changing exhibits, as well as special services, like free delivery, trying works before buying and flexible payment plans. Lane Arts Council, founded in 1976, is a nonprofit organization with the mission to cultivate strong and creative arts communities in Lane County. Lane Arts Council supports local artists and arts organizations, provides in-school arts education programs and facilitates arts experiences through community programs, such as the Community Arts Grant and the First Friday ArtWalk. Ignite opportunities for kids to make art! Attend the ArtSpark gala on April 26th to support arts education in Eugene 4J schools. Bringing Art to Life! Founded in 1950, The Maude Kerns Art Center is a nonprofit community center dedicated to the visual arts. Its mission is to promote and advocate for the creation and appreciation of the visual arts by offering a wide variety of education and exhibition programs for all ages, as well as studio space for artists and support for community artists. Visit and/or volunteer at Maude Kerns Art Center at 1910 E. 15th Ave. Eugene, 97403. Galleries, Gift Shop, Classes, Studios, Events/Art and Vineyard Sponsorship. MECCA’s mission is to divert materials from the waste stream and bring them into our community’s creative endeavors. It inspires people to think differently about waste, while breaking down the financial barriers to arts and creativity, through three program areas: education, artist services and the Materials Exchange. MECCA offers affordable workshops, family programs, and an annual Object Afterlife Art Challenge, in addition to donating materials to educators and community arts projects. MECCA is currently recruiting potential board members to represent the arts, education and environmental sustainability. MEDGE is a volunteer-run, nonprofit organization that provides a venue for fostering performance, education and the enjoyment of Middle Eastern dance. The organization was founded in 1991 and has a membership of more than 120 performers, musicians, teachers, students and supporters. The guild is open to all who share its vision of education and enjoyment in Middle Eastern dance and music. MEDGE sponsors professional shows, workshops and lectures in the Eugene area. Attend monthly shows held each 2nd Saturday, 7 pm, at Whirled Pies downtown at 8th & Charnelton. Don’t miss the International Dance Day show on April 13, 2019. Presenting the masterworks of J.S. Bach and Bach-inspired works to audiences for nearly five decades, Oregon Bach Festival began at the invitation of Dr. Royce Saltzman, former associate dean of the University of Oregon School of Music, in collaboration with German conductor and organist Helmuth Rilling. In addition to traditional choral-orchestral works, the Festival presents internationally renowned guest artists, family programing, community events and educational opportunities. Tickets available May 2, 2019, online, by phone or in-person at the Hult Center Box Office. To inquire about seasonal work for 2019, contact the Oregon Bach Festival. Celebrating its 38th season, Oregon Mozart Players is a professional chamber orchestra. In addition to a concert series, members perform substantial educational outreach, reaching children as young as 2.5 years to adults, well past age 100. Vigorous advocates of music, Oregon Mozart Players constantly evaluates missing opportunities in the community in an effort to make music available to all. There are many opportunities, including volunteering, interning, becoming a board member or concert patron, or helping to expand educational programs and much more! Radio Redux performs vintage radio scripts live at the Hult Center fifteen times a year. Each show features live sound effects and commercials, dynamic actors and music for a visual and aural treat that’s “Radio Worth Watching.” Now in its 10th year, the critically acclaimed Radio Redux re-creates classic stories, as originally performed live on stage before a studio audience in the 1940s. If you like podcasts, you’ll love Radio Redux! Radio Redux has opportunities for actors, musicians, donors, support personnel, board members, sponsors and advertisers. Contact Radio Redux through its website. & Coast region. Its events calendar is full of arts activities and is open to area arts organizations. Artists and arts organizations are represented on the Travel Lane County board, and staff members are involved in local arts organizations. Recognizing the value to residents and visitors, Travel Lane County is dedicated to enhancing and promoting this key economic sector. Show Your Ticket: By showing your ticket at participating businesses, you can get special discounts up to four days before and up to four days after performances.